We are looking for beta testers for Eden Isle. If you have an iPhone or iPad and want to play the game before it’s in the app store just drop an email to hello@simteractive.com and we’ll add you to our list of testers so you’ll be able to access the game through TestFlight. We want beta testers to play the game normally, as you would if you’d downloaded the game from the app store. You can help us out by reporting bugs here but this is optional. More info on beta testing here. If you are interested in game development and looking for work experience you can apply here. 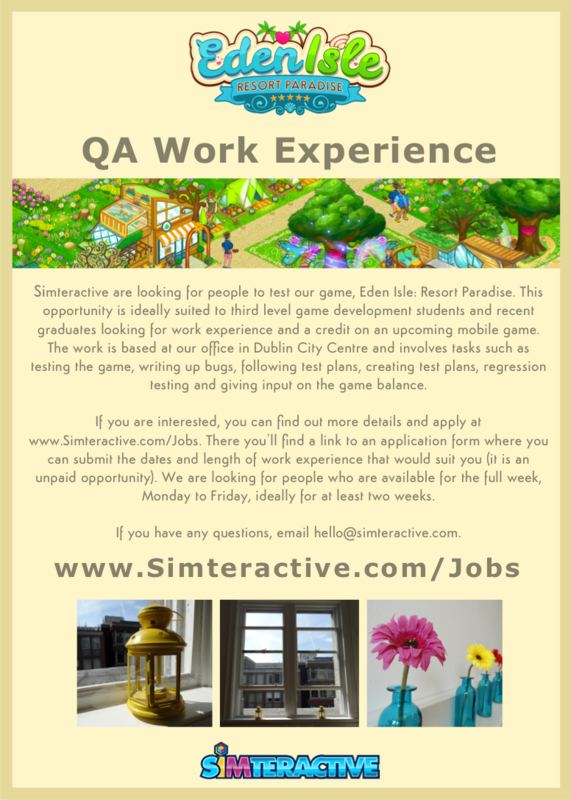 This is most suited to third level students studying game development looking for work experience but we will also consider transition year students. See the blog post here for more info on what’s involved. Email hello@simteractive.com if you have any questions.